I was recently invited to speak on a panel at Norfolk State University. The topic was ‘The Film Industry: Its Celluloid Past, Its Digital Present, Its Limitless Future’ sponsored by the Mass Communications and Journalism Department. I’m rarely asked by academia to speak or consult with any class or workshop, and I readily agreed to participate. There are certainly more qualified people than myself who can teach film history. And those with a much better memory. Yet the hands-on experience that is acquired from the operation of an art screen for almost 40 years has taught me invaluable life lessons somewhat different than those found within Ivory Towers. You might call it street smarts. For example: how to compete with large corporate theater chains, how to be successful making risky bets on movie bookings, and how to maintain good public relations when programming controversial material. I find that the Naro Video staff is just as knowledgeable as any local faculty who teach film and media studies. Many store patrons confirm just how much they have learned from their frequent visits and ongoing relationship with their favorite staff. The ongoing dialogue is really a face to face exchange of oral story-telling. And in an age when we spend far too much time online behind screens, our personal interactions are more important than ever. But the audience that I spoke to at Norfolk State is not one that I expect to see anytime soon at the Naro complex. The students were mostly in their twenties, a market that rarely has interest in the social experience of attending art movies. In addition, the students were African American, a demographic that has always been difficult for the Naro to reach. The sad irony is that the NSU campus is located so close to Colley Ave and yet it’s so very far away. The cultures of Norfolk are separated by both color and class and this economic apartheid continues to exist despite the fifty year struggle to integrate Norfolk public schools. But ever since the sixties, white families have moved out of Norfolk into the suburbs rather than have their children bused to integrated schools. And private school enrollment has grown to accommodate the white middle-class families who can afford the tuition. The demographics of public school enrollment has flip-flopped over the years and once again has become largely segregated by color and class. Only recently have we seen a cultural melting pot in a few key areas of the city. Ever since Chipotle opened up next door to the theater, there has been an influx of young people of color who mingle and socialize on Colley Avenue. It’s too bad that it had to be a corporate chain store to jumpstart the process. But now that it has, adjacent businesses can benefit from this new market. The opportunity available for local business is comparable to the arrival of Starbucks in Ghent some years ago and the growth of local coffee shops to serve a larger clientele. I don’t know of a better place in Hampton Roads than Colley Ave to observe the merging of cultures and color. And the tolerance and friendliness that people show to each other didn’t just happen overnight The groundwork for this social experiment has been cultivated for years by local businesses, Blair Middle School, and the residents of Ghent. Ours is a real community. Not a faux Town Center that was created by suburban real estate developers and chain retailers. That’s why urban living has now become an alternative lifestyle not just for young people but for oldsters who are moving back to the city. Making contact on a human scale is more important than ever so as to counter the segregating and isolating forces of technology and car transportation. Increased personal interactions in cities among diverse populations can explain the country’s predominate voting patterns – the Republican Red vote exhibited in rural and suburban areas, and the Democratic Blue vote found in the urban centers. The election polls in and around Ghent have tilted liberal for decades now. And yet we will continue to have big social problems in this city until we address racial and economic injustice. The selling of street drugs is still one of the most lucrative unskilled jobs available for so many urban kids. And until the country perceives the use of all drugs as a health issue rather than as a legal issue, underclass communities of color will continue to be victimized and alienated by failed social policies and by predatory practices of law enforcement. The hard working students attending Norfolk State and ODU are paying good money to get a college education so as to share in the American dream. But with our area’s high unemployment among young minorities and with little in the way of opportunity for decent paying jobs after graduation, many of them will be left behind with only college debt to show for their efforts. But there is a ray of hope for the future employment of our young people. The conversion of the economy from one based on fossil fuels to renewable energy sources can provide needed jobs for our young people. 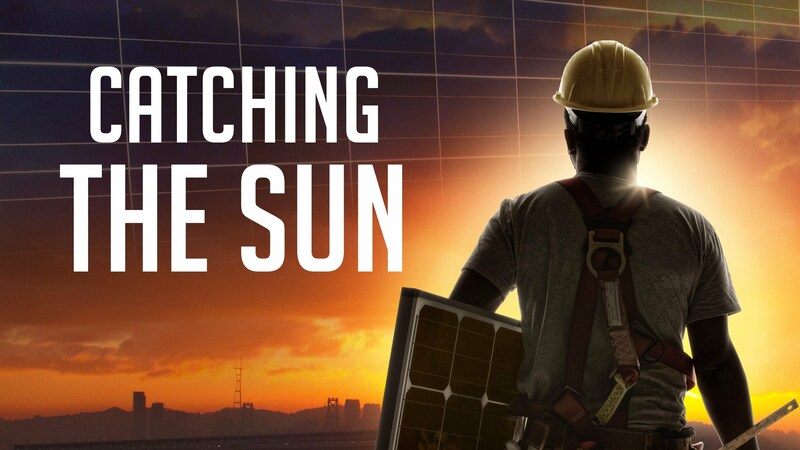 We will learn about the ongoing solar revolution that’s happening in the western U.S. and in other countries when the new documentary ‘Catching the Sun’ shows on Wed, May 11 in our ‘New Non-Fiction Film’ series presented with the Virginia Chapter of Sierra Club and Virginia Organizing. So why isn’t Virginia participating in the immense economic growth engine that a transition to solar and wind power will provide? In the post-film discussion we will discover how Dominion Power, Big Coal, Norfolk Southern, and our state legislature have colluded to obstruct the needed government incentives and policies that would ignite the solar revolution in the Commonwealth. And we’ll discuss what needs to be done so as to subvert the power and money of dirty energy. The power establishment in Virginia is nervous and has circled the wagons. As the climate and economic justice movements grow and organize, democracy for the people will be demanded. Only then will we experience what the ‘common wealth’ could really mean for the many and not just for the few. The magnificent painting by Johannes Vermeer in 1665 has been called ‘the Mona Lisa of Northern Europe’. Its recent world tour garnered huge queues for the briefest glimpse of its majestic beauty. Afterwards the painting was returned to the much-loved Mauritshuis Museum in The Hague, Netherlands, which has just completed extensive renovations. With exclusive access to this historical exhibition, the film takes the audience on a journey to answer many of the questions surrounding this enigmatic painting and its mysterious creator, Vermeer. ‘Exhibition On Screen’ is presented with Chrysler Museum. Shows Tuesday, April 19. A few decades after the destruction of the Inca empire, a Spanish expedition leaves the mountains of Peru and goes down the Amazon river in search of gold and wealth. Soon, they come across great difficulties and Don Aguirre, a ruthless man who cares only about riches, becomes their leader. But will his quest lead them to “the golden city”, or to certain destruction? Subtitled. Part of ‘Faith In Film’ series with introduction by Rev. Scott Hennessy. Shows Tuesday, April 26. Reproductive health clinics in this country are fighting to remain open. In the last five years, there have been hundreds of laws passed by state legislatures to limit and obstruct abortion providers. These have become known as TRAP laws (Targeted Regulations of Abortion Providers). As the U.S. Supreme Court decides this year whether individual states may essentially outlaw abortion, Trapped follows clinic workers, overworked doctors, and lawyers who are on the front lines of the battle to keep abortion safe and legal for millions of Americans. Presented with NARAL Pro-Choice Virginia. Shows Wed, April 27. THE OCCUPATION OF THE AMERICAN MIND: Israel’s Public Relations War in the U.S. The ongoing military occupation of Palestinian territory, the non-stop building of settlements on confiscated West Bank property, and the repeated invasions of the Gaza strip have triggered a fierce backlash against Israeli policies virtually everywhere in the world — except the United States. Narrated by musician and activist Roger Waters (Pink Floyd), the film explores how the Israeli government, the U.S. government, and the pro-Israel lobby have joined forces, often with very different motives, to shape American media coverage of the conflict in Israel’s favor. Such informed voices as Noam Chomsky, Max Blumenthal, Phyllis Bennis, and Norman Solomon provide a sweeping analysis of Israel’s decades-long public relations battle for the hearts, minds, and tax dollars of the American people in the face of widening international condemnation of its increasingly right-wing policies. Retired Army Colonel Lawrence Wilkerson will speak following the film. Shows Wednesday, May 4. This beautiful ballet production celebrates the 50th anniversary of Kenneth MacMillan’s masterpiece. The love-struck Romeo will be danced by Australian Principal Steven McRae and his beautiful Juliet by American Principal Sarah Lamb. The gripping score is by Prokofiev. ‘Royal Ballet On Screen’ is presented with Virginia Opera. Shows Wednesday matinee, May 11. The global race to lead the clean energy future is seen through the stories of workers and entrepreneurs in the U.S. as well as China and Germany. We see unemployed American workers participating in a solar jobs training program in order to find jobs in the solar industry. But the U.S. is playing catch-up in the trillion dollar global energy transition. How will the U.S. actually be able to build a clean energy economy? Presented with Virginia Chapter of Sierra Club. Shows Wednesday, May 11. The most beautiful and representative works of art of the Italian Renaissance are seen in this journey through the city that was once the cradle of civilization. We experience the best work of the masters in high definition close-up: Michelangelo, Brunelleschi, Raphael, Leonardo, Caravaggio and Botticelli. Particular attention is given to the treasure house containing many of these masterpieces, the Uffizi Gallery. Narration is provided in the historical role of the dramatically recreated Lorenzo the Magnificent, a mastermind of the Renaissance. ‘Exhibition On Screen’ is presented with Chrysler Museum. Shows Tuesday, May 17. In this richly penetrating documentary odyssey, Pulitzer Prize-winning food critic Jonathan Gold shows us a Los Angeles where ethnic cooking is a kaleidoscopic portal to the mysteries of an unwieldy city and the soul of America. Combing through colorful neighborhoods in his green pickup truck, Gold is sniffing out his next strip-mall discovery—whether Oaxacan grasshopper soup, hand-cut tonkotsu ramen, or a particularly unctuous pad see ew. As piping-hot platters are served up, so are stories of immigrants whose secret family recipes are like sacred offerings pledged for the opportunity to build their American Dream. With eternal curiosity, razor-sharp intellect, and existential longing, Gold is a culinary geographer taking us where no critic has gone before. Date to be announced.